Want to Win $10,000 Worth Of Music Prizes? GYRO's 'Big Boost' Is How! 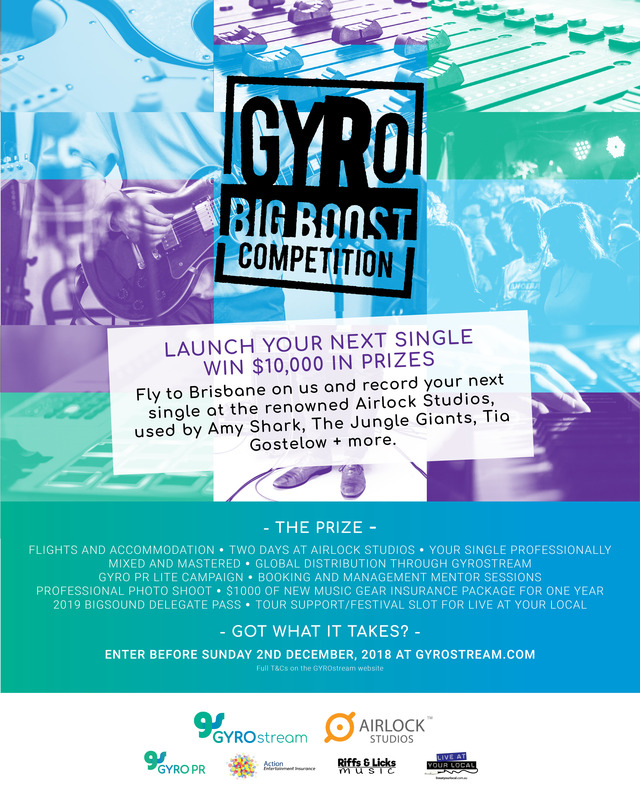 Continuing our ongoing support to Australia and New Zealand's up-and-coming and independent artists, GYROstream is now announcing our huge new artist discovery and development competition, 'Big Boost'. Aiming to give artists the leg up they need to take their music global, the contest boasts an array of pivotal music career prizes valued at a whopping $10,000. A huge pack which tackles all aspects of an artist's career, the winner will receive return flights to Brisbane from either Auckland or any capital city in Australia, as well as three nights accomodation at Airlock Studios owned by Ian Haug (Powderfinger, The Church). This is followed by two full days recording a single in Airlock Studios (used by Amy Shark, Jungle Giants, Tia Gostelow + more), alongside professional mixing and mastering and a PR Campaign with Global Distribution that will launch the new single into the world, powered by GYROstream. Looking towards the artist's future, the winner will also receive a days worth of industry mentoring sessions from booking agents and managers, alongside a professional photo shoot to enhance the acts image. It doesn't end there though - in addition, you could receive $1000 worth of new musical equipment from Riffs and Licks music store, a one year gear insurance package from Action Entertainment Insurance, a 2019 BIGSOUND delegate pass and a guaranteed gig/tour support as part of ALH's Live At Your Local Program. Artists are encouraged to join no matter their genre or stage in their career. To enter, simply make a free GYROstream account, follow the GYROstream Spotify account, and fill in the entry form with links to your social networks, bio, image and a private Soundcloud of your demo. Entries are open until Sunday 2 December, with the winner announced on Monday 10 December. Recording sessions will take place January/February of 2019.